70240 Antique Chinese Peking Rug 07'03 X 09'04 From Esmaili Rugs Collection. This antique Chinese Peking rug was produced at the turn of the century. Featuring Chinese cloud-like forms throughout, this antique Peking rug displays soft pastel shades of pink, blue, green, yellow, and beige and dark ink blue accents. It is framed with a contrasting dark ink blue outer border. The flowers feature cloud-like petals that extend and radiate from an organic, ogival center medallion into the field and toward the corners and corner spandrels. This antique Chinese Peking rug is suitable for a variety of interiors, especially traditional interiors with Southern charm, or those with Asian elements. 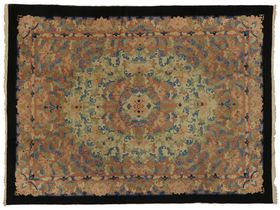 Beautiful, feminine, and ornate, this hand-knotted Chinese Peking rug will charm nearly any visitor to your home. Hand-knotted wool. Made in China. Measures: 07'03 X 09'04.